Hey! I’m Leila, your online Intuitive Life and Business Coach, specialising in coaching ambitious women who are empaths, intuitives, energy healers and spiritually minded coaches to grow in confidence to be more visible in their life and work, believe in their abilities and create incredible business full of health, wealth, happiness and success. Over the last few weeks, I’ve been share numerous resources around Reiki, Chakras and energy healing-love this and want more of it? Head over here for the rest! The first Google search of ‘spiritual awakening’ is this: A sense of connection to the spiritual force that pervades the whole universe and that forms the essence of our being that occurs at higher intensities of wakefulness and is one of the main signs of spiritual awakening. In my lingo, spiritual awakening feels like realising that I am part of something much bigger than myself, and the human race, and that what I thought I had control over, is actually predefined for us before we even get here in this life time. My whole journey of spiritual awakening came when my sister passed away suddenly. I started to wonder if what my life was like up to this point was all there was to life. Was there more? Or would I spend the rest of my life working hard, never having time to see loved ones? When I started asking those questions through bouts of depression and emotional eating, I started to receive answers, in the form of subconscious breakthroughs. When that happened, I got curious about all things spiritual and holistic and the rest is history! As you awaken to the forces around you that are much bigger than you, that can create a lot of confusion. Using Reiki as you journal through any confusion is a really powerful way to increase clarity and you open up your awareness on a mind, body and spirit level. As you awaken you will start to experience a greater range of emotions, which is perfectly normal, although may feel uncomfortable a times because we are conditioned and programmed to hide emotions like anger, guilt, shame. Using Reiki to support you to clear these emotions and make peace with the ones you are not so proud to share right now, so you can embody all of these parts of you. This will allow you to embrace every polarity and every emotion you are feeling. As you awaken, you realise that everything you desire is already out there, awaiting your manifesting, asking for it and aligning with it, vibrationally. Reiki raises your vibration, creates space within your energy field for that you wish for, to come to you. 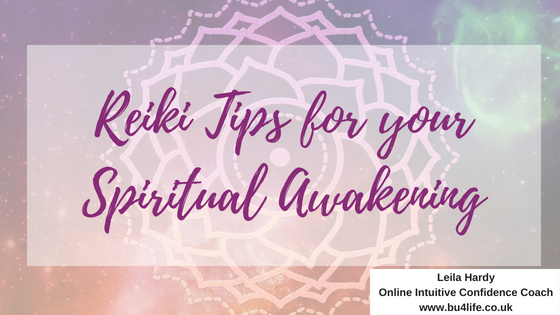 These are just a few powerful ways to use Reiki for your spiritual awakening, what others have you tried? To learn more ways to support yourself with Reiki through your own spiritual awakening, you can sign up for Reiki Level I & II as a self-study course, or LIVE ROUND to experience the support of Reiki healing as you awaken and move into your aligned life, with confidence, ease and flow!